Un préampli micro classique à lampes et un compresseur de style LA-2A en une seule unité. Le LA-610 MkII associe un préampli micro vintage entièrement à lampes, fabriqué à la main aux USA – entendu sur des albums de Coldplay, The Beach Boys et Van Halen devenus des classiques – avec d'authentiques circuits de compression optique T4 Teletronix. Ce modèle classique de tranche de console, avec son préampli chaleureux et sa compression douce et naturelle, est agrémenté de fonctionnalités modernes demandées par les utilisateurs, comme le véritable bypass du compresseur, un affichage de niveau plus grand, un niveau de sortie accru, et une alimentation à découpage. Compresser les signaux avec d'authentiques circuits T4 Teletronix de compression optique à lampe. Le LA-610 MkII est basé sur les légendaires modules de console mis au point par Bill Putnam dans les années 60. D'innombrables classiques ont été enregistrés au moyen du préampli 610, réputé pour son caractère musical et sa chaleur, par des artistes allant de Frank Sinatra à Coldplay, des Beach Boys à Van Halen. Le LA-610 MkII apportera à vos sources la même chaleur soyeuse et vintage que l'ampli de la console d'origine. Le compresseur à lampes T4 du LA-610 MkII offre la limitation ultra chaleureuse qui a fait du LA-2A Teletronix le roi de la grosse compression optique. Le détecteur électro-optique, ou « cellule T4 », est le cœur et l'âme du LA-2A Teletronix. Ses photo-résistances sont les composants essentiels du circuit, donnant au compresseur sa chaleur caractéristique, qui en fait un « incontournable » pour enregistrer les voix, les basses ou les guitares acoustiques. Il est impossible de sortir un mauvais son des légendaires circuits de préampli et de compression du LA-610 MkII une fois pris ensemble. Does an outstanding job without breaking the bank. It's all I use on bass now. One of the best strips going! I'm a luck star, i have two LA-610 MKII, they are my best device, Thanks, UA!!! I have had this for about a year now. At first I was underwhelmed. The pre does not have an over the top 'TUBE' vibe like some preamps do. It just seems to do it's job without complaints. However after using it a while I started to notice that it is actually very very good in an unobtrusive way. I simply can not get this pre to sound harsh or strident, but it does not sound dark either. Did I mention this is good on bass guitar? I recorded a Stingray with the hiZ input. Very little tweaking and it was one of the better DI recordings I have ever done. Perfect amount of bite, sizzle and nice fat low end. Cons, no highpass filter so you have to use the low EQ for that. It would be nice to be able to boost the mid bass and cut sub lows. I love this bad boy. my go to for vocals, i'm a baritenor and its luscious in the low with the highs right where i need them. or just plug and play my guitar or bass with an optical compression, what more do i need... well i do have an apollo so i guess its a UA love affair!!!! Hello, here is my review of the La-610 MkII channel strip. I am not going to tell the features again, the product page does it quite well. I use it in a home studio to record almost anything : Drums, vocals, basses, guitars, pianos. I already knew the amazing sound of the 610 Mic pre, as I already had a 6176 before I bought the LA-610. The 610 is absolutely sweet and warm (SSL addicts should not stay here). I like to push it with the +10 gain. The EQ section is simple yet usefull on any source. Let's talk about the compressor, wich is built on the LA-2A tube leveler. I use it on snare drums, vocals and clean electric guitars (like rickenbacker's). The fact is that this comp has an really cool color, but you can't use it on anything. It is used at its best on sources with a Â«Â middlerangeÂ Â» color, like vocals, or even snares. It doesn't work well on kicks (i use the brightness of the 1176 from the 6176) as it gives to much middlerange, and on any source that doesn't need a boost in middlerange. This is why I give it 4 stars, and also for the fact that it doesnt have the Â«Â splitÂ Â» function of the 6176, wich means I can't use the comp alone. Salut, voici mon test du channelstrip LA-610 MKII. Je ne vais pas m'attarder sur les caractÃ©ristiques, rÃ©fÃ©rez-vous Ã la page du produit. Je m'en sers en home studio pour enregistrer tout type de sources : batterie, voix, guitares, basses et mÃªme un piano droit. Je connaissais dÃ©jÃ le son du prÃ©ampli 610, puisque je possÃ©dais dÃ©jÃ le 6176 avant d'acheter le LA-610. Le son est trÃ¨s doux et chaud, il arrondit les angles (Fans du son SSL, passez votre chemin). Il excelle lorsqu'on le pousse dans ses limites avec le gain Ã +10. L'Ã©galiseur est aussi simple qu'utile sur n'importe quelle source. Voyons le compresseur Ã lampes, construit Ã partir du classique LA-2A. Je m'en sers sur la caisse claire, les guitares clean (rickenbacker pour les connaisseurs), et les voix. Ce compresseur dÃ©livre une chouette couleur, trÃ¨s typÃ©e mÃ©dium chaud, qui ne le rend pas absolument polyvalent. Il est le plus efficace sur les sources chargÃ©es en mÃ©diums, comme les voix ou mÃªme la caisse claire. Il faut l'Ã©viter sur la grosse caisse (je prÃ©fÃ¨re la brillance du 1176), et plus gÃ©nÃ©ralement sur toute source ou les mÃ©diums ne doivent pas Ãªtre mis en avant. C'est pour Ã§a que je lui met 4 Ã©toiles, et aussi pour l'absence de la fonction Â«Â splitÂ Â» pourant disponible sur le 6176. j'aimerai bien utiliser le compresseur seul, ou en chaine avec un autre traitement. This is my review of the LA-610 MkII after a couple weeks of daily use in a commercial recording studio. I like the flexibility of the gain staging. Picking the input impedance, input gain and preamp level for my source isn't hard - the sweet spot is generally pretty apparent and a blast to dial in. The LA2 style compression is easy to use - find a spot where it floats nicely on the source without dulling things, or sounding too grabby and you're good to go. The compression is fairly forgiving, so it's great in a situation where you need to "set it and forget it"
The EQ is very useful and musical, even though it's just shelving. +6dB @ 10k is very smooth on pop/r&b vocals, for example. Cutting with the 70hz band instantly removes most "mud" I have inevitably encountered with a darker pre like the 610. True compressor bypass allows me to accurately compare compression in and compression out. Extremely useful. Fantastic VU meter with LED light. The fact that you can not use the preamp and compressor as separate units with independent I/O really bothers me - it was almost a deal breaker to be honest. Sure, i can bypass the LA2 section if i need to patch in faster compression after the strip, but I could be using the now unused LA2 with something else in the mean timel! Or what if I wanted to run a 1176 before the LA2 to grab fast peaks and smooth things out? am trying to look for a mod but am having no luck. Input clipping isn't always super pleasant. For a long time, my go to mic pre has been a Vintech x73. I love pushing the input gain right to the edge of breaking up, on almost anything, because even when it starts clipping, it often is still very musical and pleasant. The clipping on the input gain of the 610 is, in some cases, less musical than some other preamps I have used. I use the LA-610 MkII for recording and mixing. During mixing, the EQ and compression give me a special quality of sound that I can't achieve with most plugins. For recording , I find the pre amp/EQ/compression works fantastically for vocal recording especially. The high frequency band works well at adding a pleasant "air" to the vocal when this is what I require. The compressor works very naturally when controlling the dynamics of the singer. I have not yet found an instance when the limiter option has worked well for me. I ran a comparative test between the instrument input with my Great River ME-1NV, Millennia TD-1 and the LA-610 MkII when preparing to record a bass guitar session. The Great River was very much better in my opinion than both other options. However, the LA-610 MkII performs well when capturing a direct guitar signal when I use an amp simulator in the computer. I had the LA-610 MkII go faulty mid-session recently whilst recording tabla. The power relay switch stated to flicker on and off. As it turns out there was a problem with the power supply and all the relays in the unit downstream from that flickered on/off. I was a fair bit disappointed to discover that the LA-610 MkII is made using SMD electrical components and not point to point wiring as the original UA hardware devices had before. This makes getting a repair done very much more complicated. Fortunately, the local agents in South Africa, Tuerk Music in with the help of Matt Allison have been extremely helpful in identifying the problem and helping me get the unit repaired. The only issue is that when I bought and payed for the LA-610 MkII and UAD2 solo card combo special, there was a shipment shortage from the supplier to South Africa. My unit arrive more that three months after I paid for it (worth the wait, by the way!) So now, when it came to repair the unit, it appears that I am out of warranty when in fact I am not. I will have to pay for the new power supply myself! If the folks at UAD a reading this, please see if you can rectify this. Paul Martin at Tuerk Music is my main contact for this if you choose to follow up. In summary, I love using the LA-610 MkII. It will remain with me as a key part of my work as long as I am able to keep working in the exciting world of music recording! Both 610 preamp and LA-2A compressor are evergreen classics, and their sound signature doesn't need more explanations. The combination of the two is something extremely powerful and usable. One of my main concerns, when I was thinking to buy it, was the absence of independent I/O sections for preamp and compressor (like i.e. the 6176 channel strip). On the LA-610, you can bypass the compressor section, but you can't do the same with the preamp section. So, I was afraid to get a not completely flexible gear as the 6176 is. When I finally got it in my studio, I started to experiment with it not only as a front-end gear for recording (this was obviously the main purpose I bought it for), but also for tracking previously recorded tracks (using the Line level input and output). There, I discovered the LA-610 can effectively be used as a standalone compressor, when needed, with its own lovely personal sound, when keeping the input preamp gain low enough to give minimum sound coloration. Furthermore, I'm now used (for vocals especially) to record using very neutral preamps, and retracking afterwards through the LA-610. This way, I have a lot more flexibility, and I can fine-tune the LA-610 to make the tracks to sit perfectly in the mix without any other processing. 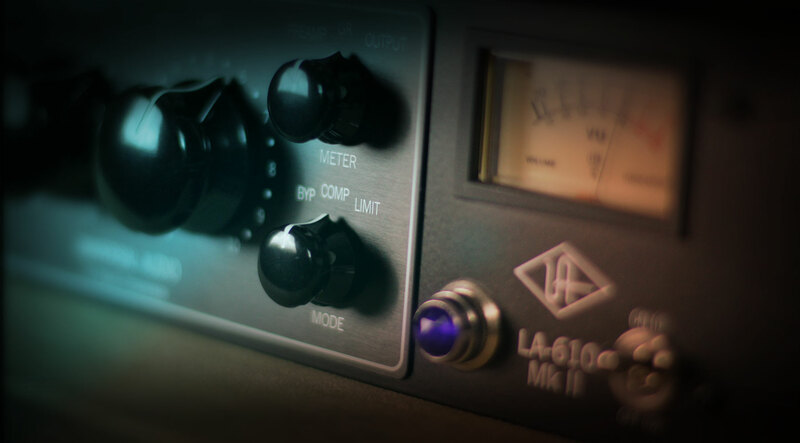 Definitely, the LA-610 is a really complete gear, you can use it as a front end pre or pre+compressor, but also as a standalone compressor, and as a "plugin" for tracking. Ok. So I bought it because I got a free UAD-2 Duo card (which I use all the time and love). and its rep and some friends recomendations I figured why not great deal right. I will state here for the record that it sat unopened for months. I just didn't have a call for it. But a jazz vocal session just the thing right?! Well I for one am sadly underwhelmed and will try the box as a DI. But as a channel strip it did not make the cut. Well maybe my engineering skills just aren't right for this unit. I got it to work ok for some things. I have it boxed up to sell. I put it on ebay for 1000 and no takers. I'll try it again for 900, which seems low since I paid 1600, but then I did get the card with it, which is doing me pretty good. I found a used Avalon that is working so much better for me as a main preamp than the 610mk2. I've had a few people tell me that the 2-610 is a better thing to have, and maybe I'll get one of those eventually. But right now I'm curious about 'iron' so I think my next one will be a neve so I can see what that's all about. Great strip for bass, vocals, guitars, snare. Especially if you change the tubes and put NOS tubes sounds amazing! A real workhorse! A pair of these can make real magic! Experimented with this on the way into my DAW and was pleasantly surprised how great the snare track sounded. Just added a skosh of eq crack at 8k and thats all it needed. My new goto for snare drums! I bought this unit I connected and recorded some acoustic guitars and let me tell you I felt in love with this unit just by tweaking just a little bit I got a beautiful warm and rounded sound. Some people complain about not having a bypass for the Pre-amp like other UA unit they haven't realize that you can lower all the level down on the Pre it just add an extra character a little color to the Comp don't compare it with other units its a different animal is another tool to use in your Studio. I Love this beauty. I feel as though this is one of those things UA users already know. But, If you're new to UA and looking for a lower grade mic pre in order to be mindful of budget. Don't do it. You'll eventually end up owning one of these or a 6176. And in the meantime, you will have spent more money on different gear trying to achieve the sound you're hearing in your head, along the way. As a younger engineer, I learned that lesson the hard way. Regardless of what UA product you're looking at, you can't lose. Whether for vox or acoustic guitar, the LA-610 MKII is one piece of outboard gear I will not give up. Serves wonderfully as a pre to my Apollo, and gives an excellent alternative to the Apollo's great Unison preamps.